Installing Ferro Rod holder in Condor Knife Sheaths any suggestions? Discussion in 'Edged Tools' started by chekmate, Aug 4, 2015. I've been trying to come up with a simple way to add a Ferro Rod holder on my Condor knife sheaths. I'm over thinking it, or havin a brain fart on this. I know someone out in BCUSA land should have a simple solution. Looking forward to hearing everyone's ideas. I've been thinking about this myself looking forward to replies. Stitching a leather loop using the existing seam holes or taking it apart and restitching what you want together. Maybe riveting something on if there is room inside the sheath. just use bicycle inner tubing,ive tried all the ways to do it including restitchign the leather but really bicycle innertubing works perfectly and takes like 2 minutes to add,keeps it dry also. The only problem with ranger bands, they will suffer catastrophic failures with little or no warning. Resulting in loss of equipment. I cut my ranger bands an inch or more thick. Then I use shock cord as a lanyard of my firesteel and loop that around the bottom of the ferro rod. I have not had one fail in this fashion yet. On this particular condor kephart I also wrapped the sheath and ranger band in parrifin dipped jute twine to have some tinder available. I never used the tinder though. Northern Michigan is a tinder gold mine. Yeah, I've only had one fail but, that was enough. I still use them for various things like keepers and shock absorbers on my tarp lines. Just not to secure important equipment. Simple would be to stitch the loop about an inch wide with at least one inch tabs extending past the stitching. Flair the tabs out around the spine of the sheath and glue them down, punch small holes through the tabs and the sheath, and rivet into place. Less simple is to separate 2 to 3 inches of stitching, remove an inch of welt, trim the tabs to width and taper the tabs for thickness, glue in place and restitch. A touchy method would be to cut small slots in the spine of the sheath about an inch and a half apart, wet the leather and slowly stretch the leather between the slots to accept the fire steel. This would have to be done with the knife or good replacement in the sheath so the stretching accommodates both the knife and steel. Lashing the fire steel to the sheath works, but I'm seeing interference in how the knife fits in the sheath on the few I've done it to and there are concerns over slicing up the sheath while drawing or inserting the knife. The best method I can think of is to just make, or have made, a new sheath, modeled with the features you want. Lots of great ideas. Thank You! If you have any others feel free to post them. I did one like DBX's.... pretty sure I just posted it up under the "Daily Doings" thread, as I didn't think it was all that interesting... I'll dig around for pics tonight when I get home, but it's pretty simple... I just marked where I wanted the firesteel loop, cut the threads, cut out the piece of leather that was in the way (it has a name... keeps the blade from cutting the threads), stuck the new loop in, poked a needle through each old hole to mark the loop, drilled the holes in the loop, and then sewed them in. Pretty simple. Rather than locating the loop on the edge of the welt, I like to set it on the face of the sheath...resewing in the original stitch holes. I carry an extra one there, also. I like that idea! I'll try that on the next sheath I make. You can make one of kydex then screw it on or use rivets. TOPS Knives makes a ferro rod/magnesium kit with a kydex holder that you can attach to about any sheath with enclosed screws. It shouldn't be too hard to punch/drill through the leather and attach it to the welt of the sheath. Add a little epoxy and you'd have a very tight set-up! Same here ,rubber ranger band with security lanyard for ferro rod/sharpener and hacksaw striker but never had a band failure and if your worried about it just keep an extra band on your sheath. there is very little spare meat on the condor sheath to add anything unless you restitch it but its alot of work and i would add rangerband over it anyway just to keep it firm against the sheath so it doesnt snag stuff. Firesteel holder made of kydex. From DLT. I smeared clear silicone on a Light my Fire, covering the entire rod to stop corrosion (or you can cover the rod in dollar store nail polish ). Then I slipped a chunk of clear fuel line over that. It is quiet and unobtrusive hanging on my neck with para cord. I have had this same rod for years now and it should be good for many more. I ALWAYS have this rod as my back up car keys are on the same para cord. I had to knock a back window out many years ago to enter a car and I didn't want a repeat, out in the middle of nowhere. Other than that I tend to carry a couple of lighters. The rod is a back up and I have practiced with these things so much that I almost don't use them anymore...I am confident. I have a few users laying around that I will toss in a pocket now and then for giggles n schnitz. I thought I had a pic of it, but cannot find it. A friend asked me to come up with a way to attach a firesteel to his Western bowie sheath, but he didnt want to cut the original Western sheath. 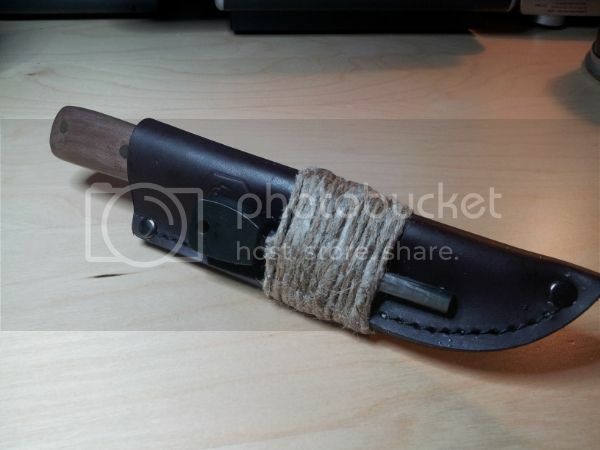 I made a firesteel carrier that slipped around the sheath and then you laced it on tightly with some leather thongs. No cutting the sheath or any mods to the sheath. He has moved away now, so I do not know how it held up? Inspired by Sporks work I added a flashlight holder on my Condor Kepart sheath. Condor sheaths are quite excellent but just a bit to stiff for me so the first thing I did was beat the snot out of it with a rubber hammer. Next I rounded the edges, applied some dye and waxed the heck out of it. The sheath is a lot softer now. With a brass D-ring added it makes for a fine dangler. The flashlight is a Walmart find from over a year ago. No name on it. It takes two AAA batteries, is water resistant and very bright.